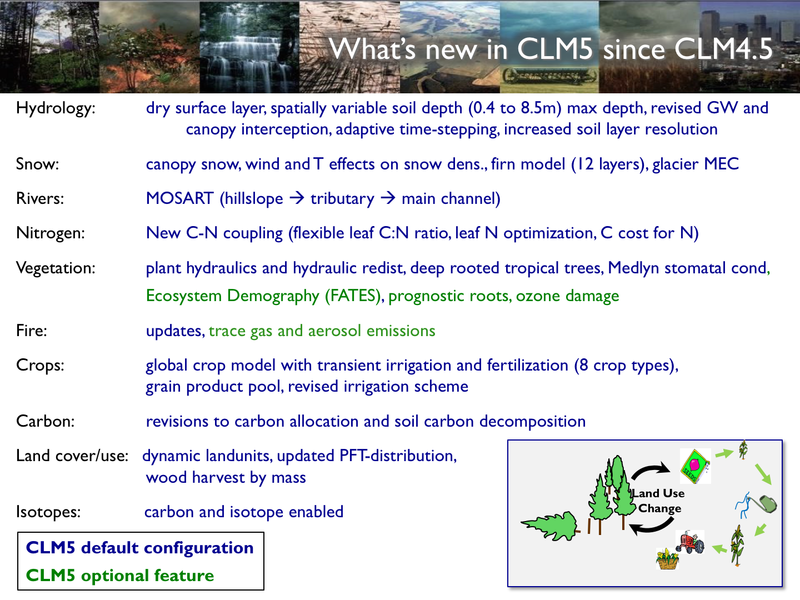 CLM5.0 is the latest in a series of land models developed through the CESM project. More information on the CLM project and access to previous released CLM model versions and documentation can be found via the CLM Web Page. 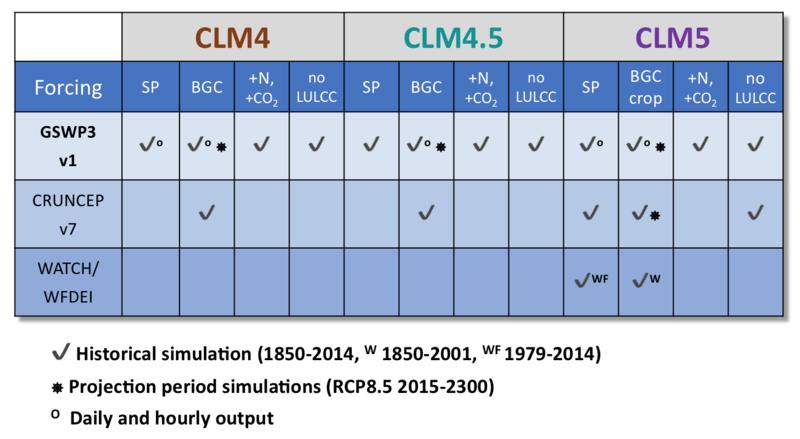 Note that CLM4.5 biogeophysics and biogeochemistry can be run from this release code. A new river model (MOSART) is also included. This release is a land-only release. The capability to run CLM5.0 within CESM2.0 will be included in the CESM2.0 release. The Functionally Assembled Terrestrial Ecosystem Simulator [FATES] is available within the CLM5 release as a research option. All future CLM development will occur within the framework of CTSM. CLM will be an instantiation of CTSM. Lawrence, D.M. R.A. Fisher, C.D. Koven, K.W. Oleson, S.C. Swenson, G. Bonan, N. Collier, B. Ghimire, L. van Kampenhout, D. Kennedy, E. Kluzek, P.J. Lawrence, F. Li, H. Li, D. Lombardozzi, W.J. Riley, W.J. Sacks, M. Shi, M. Vertenstein, W.R. Wieder,, C. Xu, A.A. Ali, A.M. Badger, G. Bisht, M.A. Brunke, S.P. Burns,, J. Buzan, M. Clark, A. Craig, K. Dahlin, B. Drewniak, J.B. Fisher, M. Flanner, A.M. Fox, P. Gentine, F.Hoffman, G. Keppel-Aleks, R., Knox, S. Kumar, J. Lenaerts, L.R. Leung, W.H. Lipscomb, Y. Lu, A., Pandey, J.D. Pelletier, J. Perket,, J.T. Randerson, D.M. Ricciuto, B.M., Sanderson, A. Slater, Z.M. Subin, J. Tang, R.Q. Thomas, M. Val Martin, and X. Zeng, 2018: The Community Land Model version 5: Description of new features, benchmarking, and impact of forcing uncertainty. Submitted to J. Adv. Model. Earth Syst.